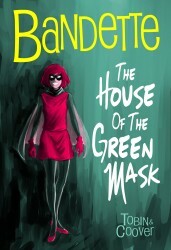 A new chapter begins in a brilliant career Bandette, the greatest thief in the world! Scarlet dressed young adventurer enjoys a little light entertainment in the theater, and leaves with a priceless treasure that can hold the key to the mystery of a legendary: the secret of the house green mask! However, while the Absinthe and the cartel offense, FINIS, are brought to justice, thinner, more sinister threat lurking in the shadows! Who is this ... Voice?